A head injury in a grown adult is bad enough. Such traumatic brain injuries often lead to a lifetime of recovery, changes in behavior, and lifestyle alterations that take quite a toll on both the individual and the family. For a child, the situation is worse. A serious head injury in a child can affect crucial development for years to come. Parents often worry that their beloved child will never fully recover from the injury, or that it will worsen over time. According to research, one in 30 newborns will endure traumatic brain injury by the time they turn 16 years old. These injuries lead to impairments that persist for five years after the incident at minimum. 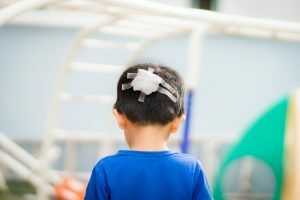 Researcher Vicki Anderson, Ph.D., professor of pediatrics and psychology at the University of Melbourne, examined a group of children for a recent study regarding traumatic brain injuries in kids. In total, 40 children took part in the study. These kids were divided into three groups: mild injuries, moderate injuries, and severe injuries. Those with the most severe traumatic brain injuries had the worst outcome and longest recovery time frame, obviously. According to Anderson, many of these children experience issues with their thinking skills more than any other area. Their overall IQ suffered because of the accident, too. Most were 18 to 26 points lower than the average. Still, no matter the severity of the injury, Anderson put their recovery “trajectory” at five to 10 years. After that, the kids begin to stabilize and make serious gains. They remain behind their classmates and friends, however. The emotion and development deficits often coincide because of this fact. Before this study was conducted, many doctors and researchers believed that children with TBI would only worsen with time. However, according to Anderson, this is not the case. The negative effects plateau over time, though the children will never catch up fully. As a parent, you will play the most significant role in helping your child recover after a traumatic brain injury. You can provide professionals, such as doctors and psychiatrists, to help assess the day-to-day activities of your son or daughter. During the rehabilitation process, parent involvement directly affects how the child reacts to their situation, their recovery, and how they address the return to home and to school. Further, during the rehabilitation phase, your child may have difficulty walking, keeping up with personal hygiene, expressing their wants, needs, and desires, and remembering key moments or how to complete a task. They will need all the assistance available to push through this period. Slowly but surely, your child will make small steps and begin on the road to improvement. It is not a losing battle by any means. Over time, larger accomplishments will be made. If your child has suffered from a traumatic brain injury and is on the path to healing, you may require a support network to push through those last few stages. Allow TryMunity to be your helping hand. Please feel free to call us at any time at (844) 838-2900.